FlexRM’s membership app for Microsoft Dynamics 365 makes it easier for organisations to manage and grow their membership base and empowers users to provide an excellent customer experience whilst utilising the latest technology from Microsoft and FlexRM. FlexRM’s membership app offers the flexibility to manage both organisational and contact level memberships, with the ability to configure membership types to your organisation’s specific needs. Microsoft Dynamics 365 with FlexRM’s membership app will transform your membership organisation, making data more accessible to your members, simplifying processes for your employees, freeing them to provide the customer experience your members require and empowering them to grow your organisation to the next level. The AUA is the professional association for higher education administrators and managers. 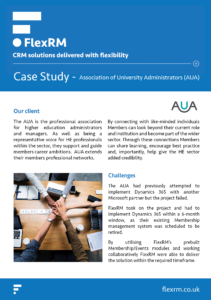 The AUA had previously attempted to implement Dynamics 365 with another Microsoft partner but the project failed. FlexRM took on the project and had to implement Dynamics 365 within a 6-month window, as their existing Membership management system was scheduled to be retired. By utilising FlexRM’s prebuilt Membership/Events modules and working collaboratively FlexRM were able to deliver the solution within the required timeframe. FlexRM have extended the standard product catalogue to support the majority of membership type scenarios, whilst maintaining the powerful out of the box functionality provided by Dynamics 365. This means you have the ability to configure your membership structure and pricing to your exact requirements. Users can easily enrol, renew or upgrade memberships either individually or in groups, with the ability to take payment from within the app itself using a payment provider of your choice. Configurable payment types allow administrators to set up the payment methods they need and apply discounts based on their chosen payment types. Out of the box direct debit files can be generated for processing by your bank or the solution can be extended to support your paperless direct debit requirements. Scheduled tasks such as automatic membership renewals and lapsing of expired memberships are also handled out-of-the-box, with the ability to add more automated tasks should your organisation need it. FlexRM’s membership app provides a number of automated communications out-of-the-box, such as welcome packs, renewal reminders and upgrade confirmations, each with user configurable content, which can be changed easily to match your organisation’s brand. By utilising the included Dynamics 365 connected portal, members can manage their memberships online, engage in online discussions and access frequently asked questions and articles. If you already have your own membership portal, FlexRM’s membership app can be configured to connect to your existing solution in order to provide your members with the information they need, when they need it. I agree to receive other communications from FlexRM.